San Francisco activists staged more actions and rallies this week, even as the Army Corps of Engineers said it finished a review of the disputed Dakota Access pipeline and would listen to the native people before making a decision. 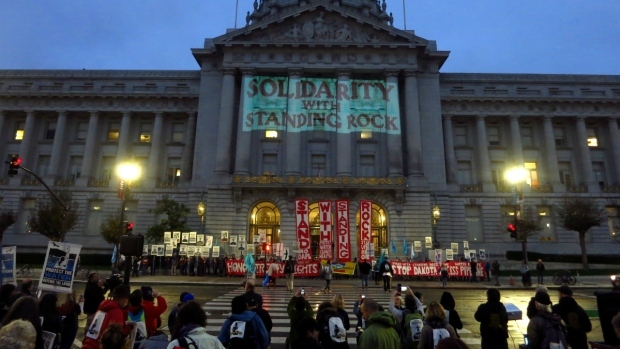 Early Tuesday morning, as many as 2,000 activists showed up in front of San Francisco City Hall for a "sunrise ceremony" in an effort dubbed "Stand with Standing Rock: Stop Dakota Access Pipeline." They carried signs that said "Stand Up to Big Oil" and "Protect Our Water." A speaker who grabbed the microphone atop City Hall steps urged leaders to stop taking more oil out of the ground and "save Mother Earth." "If our water is polluted, if there’s nothing left to drink, if our food is all polluted. everyone is going to be dying the way they’re dying of cancer and all the diseases that are on the rise," protester Kristen Nadarija said. Added Elana Levy: "Indigenous people have been showing us the way for a very long time and we need to support them." 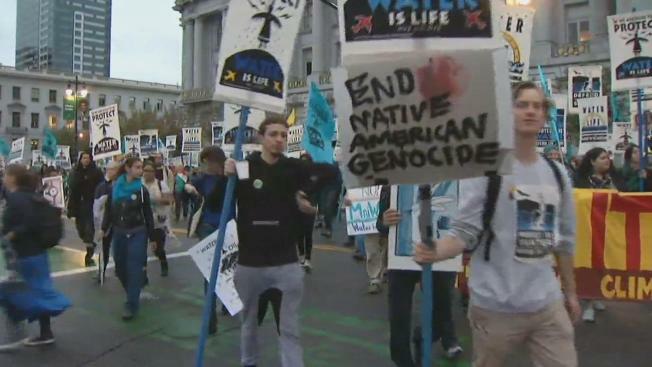 Protesters were encouraged to wear blue and then march to the U.S. Army Corps of Engineers in San Francisco. By 9 a.m., about a dozen people blocked the building, which is shared with Uber and the Transportation Authority. In nearby Silicon Valley, San Jose State University students staged a protest on campus, and the Santa Clara County Board of Supervisors on Tuesday passed a resolution that supports a moratorium on building the Dakota Access Pipeline. "When it breaks, and it will, then it will contaminate the water for millions of people," said Miriam Mosqueda with SJSU's Native American Student Organization. In Mountain View, protesters demonstrated in front of a Wells Fargo bank because they said it is one of the banks helping fund the pipeline. Protesters said they are skeptical of U.S. Army Corps of Engineers' call on Monday to conduct more studies and collect more tribal input before deciding whether to allow it to cross under a Missouri River reservoir in North Dakota. That's because Dallas-based Energy Transfer Partners, the company developing the pipeline, said it expected to be moving oil through the pipeline by early next year if it got permission. How fast that will happen now is unclear. The rallies across the country on Tuesday at such places as state Army Corps offices, federal buildings and offices of banks that have helped finance the project are seeking to draw President Barack Obama's attention. The groups, including the Indigenous Environmental Network, Honor the Earth and Greenpeace USA, want Obama to permanently halt the construction of the pipeline, the focus of confrontations between police and protesters in North Dakota for months. The corps in July granted ETP the permits needed for the project, but in September said more analysis was warranted in the wake of American Indian concerns. The Standing Rock Sioux, whose reservation will be skirted by the $3.8 billion, four-state pipeline, says it threatens its drinking water and cultural sites. ETP disputes that and said last week it is preparing to bore under the river. Army Assistant Secretary Jo-Ellen Darcy said in a letter to company officials and tribal Chairman Dave Archambault that "additional discussion with the Standing Rock Sioux Tribe and analysis are warranted." That discussion is to include potential conditions on an easement for the pipeline crossing that would reduce the risk of a spill. Darcy said the Army will work with the tribe on a timeline "that allows for robust discussion and analysis to be completed expeditiously." Army spokeswoman Moira Kelley would not elaborate to The Associated Press on whether a decision would be done by the time President Barack Obama leaves office. Donald Trump, a pipeline supporter, is set to take office in January. Archambault and ETP spokeswoman Vicki Granado did not immediately respond to Associated Press requests for comment. The 1,200-mile pipeline is to carry North Dakota oil through South Dakota and Iowa to a shipping point in Illinois. In an email to The Associated Press, ETP said it would finish the pipeline within 120 days of getting approval for the easement beneath Lake Oahe, the Missouri River reservoir in southern North Dakota. Nearly 470 protesters have been arrested since August supporting the Standing Rock Sioux. Several actions have taken place in San Francisco. On Halloween, 12 activists in San Francisco were arrested while protesting Citibank's funding of the Dakota Access pipeline. In addition to protests, there is also a San Francisco donation drive seeking winter supplies for those fighting on the reservation in North Dakota.